What is it that makes food trucks so magical? Something about a little mobile kitchen that can stop, drop, and roll out some fantastic grub just about ANYWHERE is simply spectacular to me. What tricks are they pullin’ in there? I haven’t got a clue, but I do know that I’ve had some of the best meals come out of those little truck windows, and that includes this last weekend along the Scioto Mile! Last Friday and Saturday, the cbusfoodbloggers made their way to the beautiful Scioto Mile to check out this year’s 7th annual Columbus Food Truck Festival. I know I was especially excited to attend this year because of the beautiful views of the 614 skyline (and hello, the best backdrops to food pics, ever!!) Although the forecasts called for storms all day Saturday, the rain held off as the masses stormed the trucks and filled their bellies with fried chicken, meaty subs, and everything in between! Alright, alright. Time for the food. Let’s check out what the cbusfoodbloggers had to eat at the festival! First and foremost, a big CONGRATS goes to the Barroluco Argentine Comfort Food family for winning first place! As I walked past their impressive (and massive) real-food table display of their menu items, I was greeted with a smile by everyone inside the truck. It was certainly clear that the D’Angelo family has a true passion for serving the best Argentinian-inspired food to the Columbus area. Check out this spread, yummm. Years later, the family was able to secure the business name here in Ohio as they prepared for and took part in the 17th Annual Festival Latino for the very first time. We were so happy to be able to taste a variety of the menu—my personal favorite were these juicy ribs served over Paella Rice. Don’t forget churros for dessert! As we continued on, one of the first food trucks leading up to the bridge over the Scioto River was Hai Poke. If you haven’t spotted these guys in their infamous blue and white food truck around Columbus, you aren’t getting out enough! I could eat their ahi tuna and crispy wontons almost every night of the week if I wanted to (and trust me, I’ve given it serious thought before). Every Nightlight 614 Showing the rest of the summer! Short North Location COMING SOON, AH! Another truck gaining a ton of 614 street cred this summer is Kinetic Food Truck. In case you haven’t heard, the nutrition-focused menu offers a “build-your-own salad” option, tons of healthy sides (like that watermelon feta salad I consumed in under 30 seconds!) and other pre-made healthy bowls. God BLESS a food truck that doesn’t make me feel like a beached whale after. Kinetic will pop up at a few more Nightlight 614 showings this summer, as well as the Columbus Commons Food Truck Court on Thursdays. Check their website for a full calendar of listings! Alright, if you’re thinking “Give me the typical loaded fries and the sloppy sandwiches, people! !” The next two food trucks are definitely for you. As for me, I had no other choice but to say yes to the bacon, and hella bacon is what I got! Nestled in between the crunchy waffle fries were chunks of roasted chicken drizzled with loads of creamy ranch and bacon bits. Definitely the #1 Seller for a reason. Although not technically considered a truck, this next food “cart” was just as mighty as its competitors. The Put it in Your Face Sandwich Cart is run by the husband and wife team, who slow braise their meat for hours so that it melts (and I kid you not, this sandwich MELTED) in your mouth. After hanging up his chef hat after serving famous music tours like Taylor Swift, Rascal Flatts, The Eagles, and Van Halen, Chef Rob McClaskey and his wife Christie took their talents back to the ‘bus and blessed us with their hilariously-named sandwiches. We asked for the best-seller and received the Shud-Upa-Yo Face (seen above) and wowza. This isn’t streetmeat, kids. This is some gourmet sandwich cart art. ..say that five times fast. The fresh, beer braised brisket paired perfectly with a mix of grilled onions, peppers, and melted provolone over a soft roll. Extra garlic aioli, pretty please! Next time, I’m definitely trying out the “Drunky McDrunk Face” sandwich, just so I can say the name out loud. A Columbus staple, Mikey’s Late Night Slice debuted their one-weekend-only specialty slice for the Columbus Food Truck Fest, and the Ultimate Bacon Pizza was a winner in our hearts. Did you get to try it?! The Spiffy Cookie sure did, and even wore her HCT/Late Night Slice shirt to match. Now that’s some serious outfit planning, right there! Speaking of one-weekend-only debuts.. I have three words. Just when I thought HCT couldn’t get any better, they rock my world with WAFFLE CONE FILLED MINI NUGGETS. 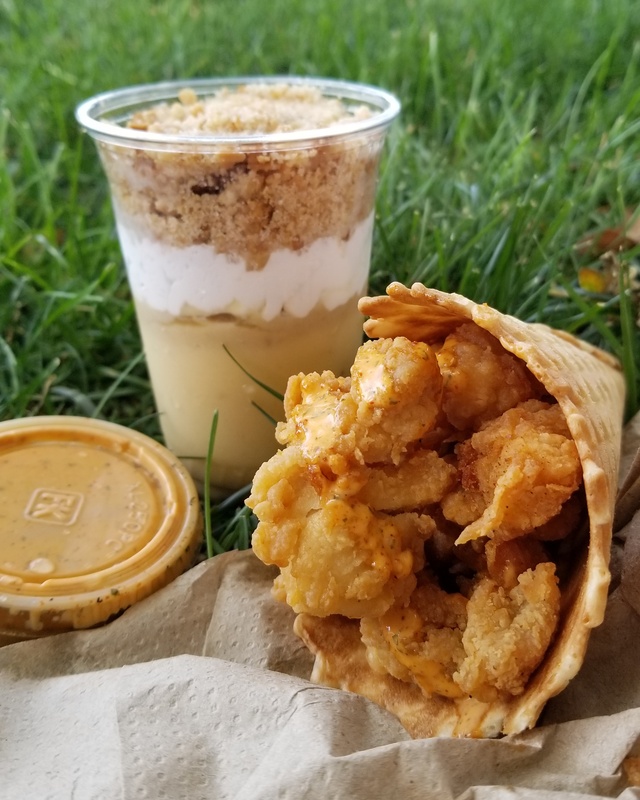 If you didn’t get a chance to try the cones that broke the internet (okay not really, but I know my feed was certainly filled with fiery hot chicken all weekend), we’re not sure when they will be back. But we really, really hope it’s soon. Pretty please, Hot Chicken? If anything, the #cbusfoodbloggers made sure to snap a few a pretty pictures! Cupzilla-Korean BBQ– Longest line award def goes to these guys. What were they putting in those cups, crack?! Rimetime Pops– The popsicle cart has taken off in popularity this summer, check them out every Saturday at the Worthington Farmers Market! Johnson’s Real Ice Cream– Talk about a perfect cap to a fantastic food truck fest day. My slightly melty (just how I like it) scoop of Moose Tracks filled in all of the empty cracks of my belly and officially sent me spiraling into a food coma that I wouldn’t recover from until Monday. Worth it. See ya next year, Columbus Food Truck Festival! One of my favorite festivals every year! Such a fun round up of the best fest of the year! !